Peaky Blinders is back. The best words you’ve read all year… apart from that time in March when your mate text you saying that Ben and Jerry’s was half price at Tesco, but still, it’s up there. Despite what you may have heard about the BBC show, it’s not all death and violence… I mean it’s mostly that, but there is more. I don’t know if the original Birmingham based gang were quite as well dressed as Cillian Murphy and co. but if so, they were some stylish fellas. 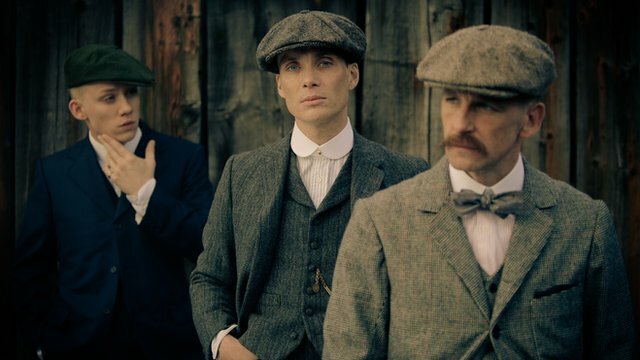 Like the original Mods, the Peaky Blinders trawl the streets of Birmingham looking for trouble in sharp suits and their peak caps. (I might look up sales in them actually because SURELY this show must have spiked them). It's the attention to detail which is the most impressive, from their distinctive haircuts to the chain of their pocket watch, this boys have it all figured out. So good, that I barely even notice the ah-may-zing 1920s dresses knocking around. And with Tommy's new international connections (and considerable amount of money- he's bloody loaded now) this season is set to be more stylish than ever.